This New Year brought alive new hopes in me and the travel bug in me was getting restless. That’s when I decided that I should explore a new country with a new passport (got it renewed last year). Excited to get the first stamp in the new notebook of my travel stories, the passport, I decided to book my ticket to the country of scenic beauty, beaches and shopping! Now, the big question was how I book my ticket. 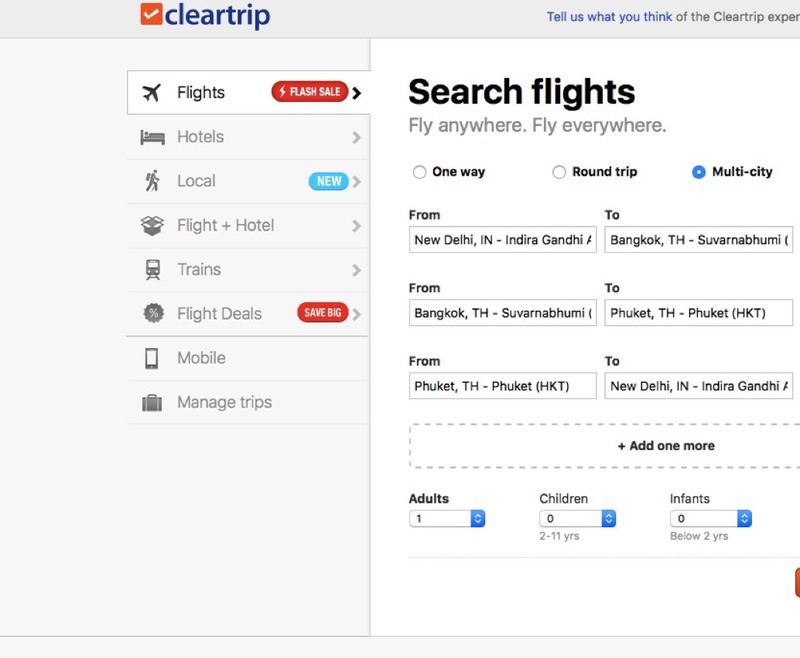 Parents would still suggest the age-old option of travel agents but I wanted a trip on my own terms and conditions according to my own itinerary keeping it quick and simple and decided on Cleartrip.com! A click on air ticket on Cleartrip’s website gave me my window to explore the new country with options of different flights across different time zones and budget. I planned to go to Bangkok, Pattaya as well as Phuket! There was no direct international flight to Pattaya, just road travel from Bangkok so the wings were only confined to Delhi – Bangkok – Phuket and back. I didn’t want to waste a day so I decided on an overnight flight from Delhi to Bangkok. The user friendly navigation of the website helped me book TG 332 on Jan 6, 2017 which meant that in just 4 hours of flying time I would reach my destination! Without a hesitation I booked by flight paying by my Debit Card! The only itch was that the e-ticket which I got on my mail didn’t mention the baggage that I am allowed to take, however, while I was booking the tickets it did mention 30 kgs. This was imperative to know the right weight allowed as travel light is not a policy that I follow, though, I intend to follow it but can never really do it! Obviously travelling means you have the right clothes, accessories, shoes, toiletries, perfumes, etc. etc. but you want to shop as well! So, you have to consider that as well. To save me from any trouble, I wrote to Cleartrip and the friendly staff attended the query in no time assuring each person is allowed to carry 30 kg of luggage. We were 2 Passengers and 60 kg did suffice our requirement. So on the designated day with our luggage we reached the Indira Gandhi International Airport from where we boarded our Thai Airways flight and reached Bangkok! Bangkok was about sight-seeing as well as shopping! We wanted to keep the first day light and went to check out the Buddhist temples! Wat Pho and Wat Arun were an architectural delight! Wat Arun is among the best known of Thailand’s landmarks and the first light of the morning reflects off the surface of the temple with pearly iridescence. Next day was a Saturday which meant it was the day to explore the famous weekend market- Chatuchak Market! This is one market that everyone looks forward to every weekend whether it’s a tourist or a local pre on from Thailand. Without much delay we took the sky train to Chatuchak. The place had some great local stuff that too at great prices. Don’t forget to negotiate with your best smile and the friendly shopkeepers around are happy to reduce done prices! We bought some interesting stuff- boots, cute slippers, T-shirts, tracks and accessories. Our day ended with the famous Thai foot massage near Chatuchak and then we were ready to go back to our hotel to have dinner and crash! 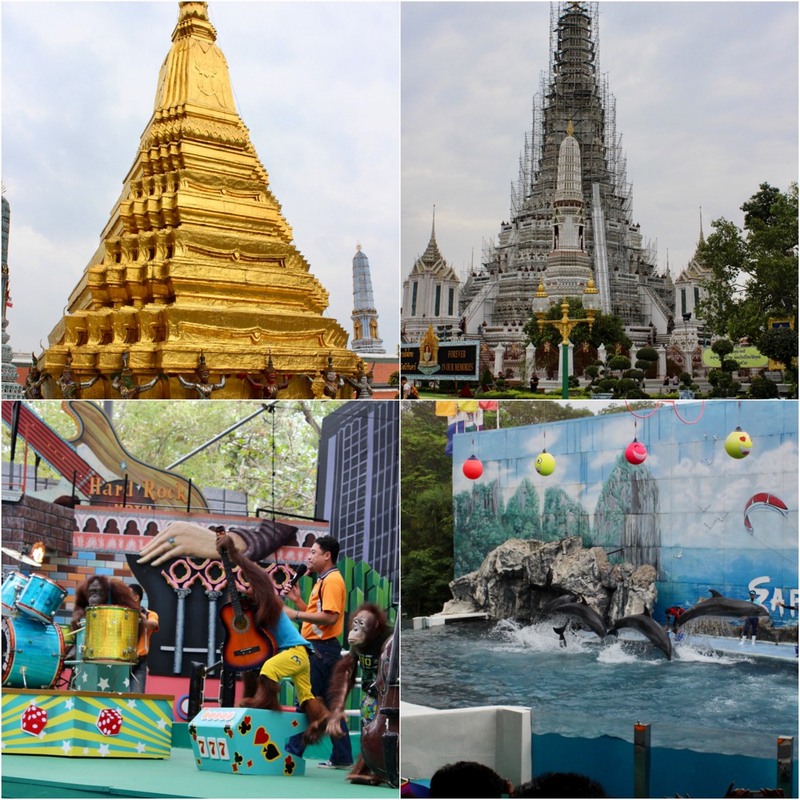 Third day in Bangkok was Safari World, our day to meet the marine life as well as other animals like tiger, elephant, giraffe, zebra, poney etc doing some fun activities. It was a true delight! We came back in the evening and decided to do some nice shopping so we headed to a few brands at Terminal 21 Mall and explored more! 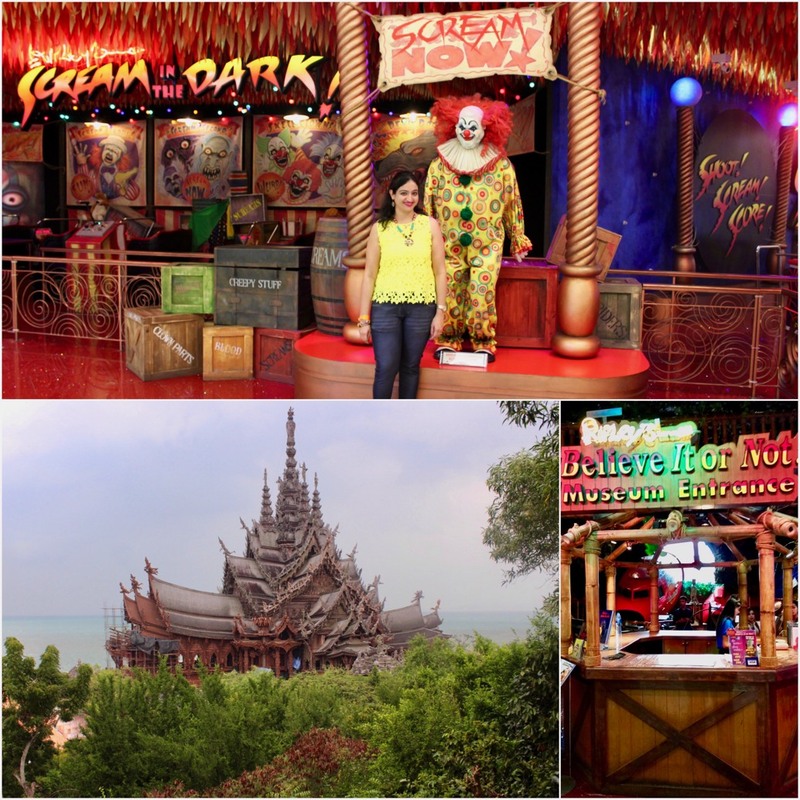 Our last day in Bangkok was a quick trip to Pattaya by road where we saw Ripley’s Believe it or not! Though I have visited the place at London but it’s always fun to revisit facts! We also explored Dungeon house and the 12D movie which were interesting. One place that should not be missed in Pattaya is Sanctuary of Truth, a temple which is an all-wood building filled with sculptures based on traditional Buddhist and Hindu motifs. Our adventures of Pattaya didn’t end here and we went to Alcazar which is an experience in itself, a stunning show of a lifetime and the most recommended attraction in Pattaya. The 70 minutes show brought forward special affects in the glitz and glamour with beautiful dancers which swayed us off our feet with their moves. 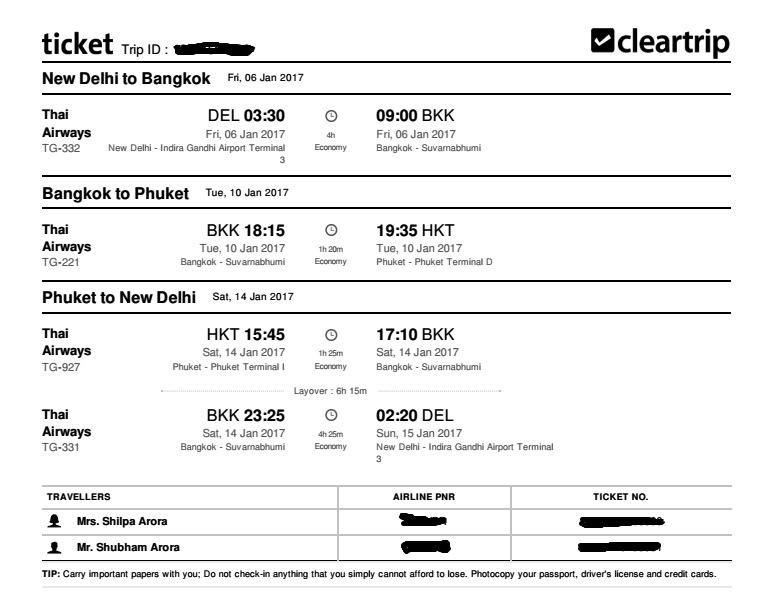 Our Cleartrip journey extended from Bangkok to Phuket! With Thai Airways TG 221, we went to Phuket, a rainforested, mountainous island in the Andaman Sea which is known for popular beaches, old shophouses and busy markets. We chose Patong the main resort town to host us which is an area full of life, thanks to the great hotels, nightclubs, bars and discos! The first day at Phuket was about exploring the city and doing some sightseeing. We took a tour and a bus came to pick us up. 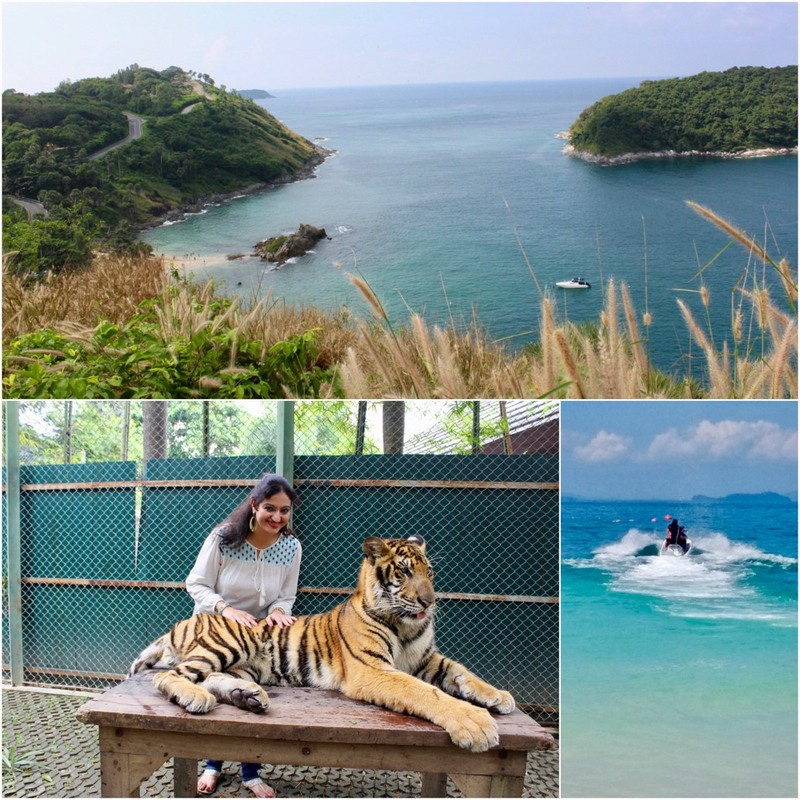 While passing through beautiful beaches and markets of Phuket, we reached Kata Viewpoint followed by Elephant camp, followed by Big Buddha, Shalong Temple, Cashewnut factory and Honey farm. I loved every bit of this place giving me the right backdrops for my photo opps! The day ended with meeting the king of the jungle at Tiger Kingdom while clicking photos and selfies with the animal! The other days were spent at various beaches – Patong as well as Phi Phi Island doing adventure activities in the water. Did a host of activities like Jet Ski, Parasailing…afterall you need to get a break from your monotonous life! We didn’t realize when time flew by and it was time to head back to our land! So with TG 927 and TG 331 booked on Cleartrip we headed back to India. Wondering why 2 flight nos.? There is no direct flight from Phuket to Delhi so we had a stopover at Bangkok Airport but thank you Cleartrip for the amazing time of our life! Great pictures! A passport is a wonderful thing! You pet a tiger?! Was that terrifying? This is so amazing! Great pictures looks so fun!